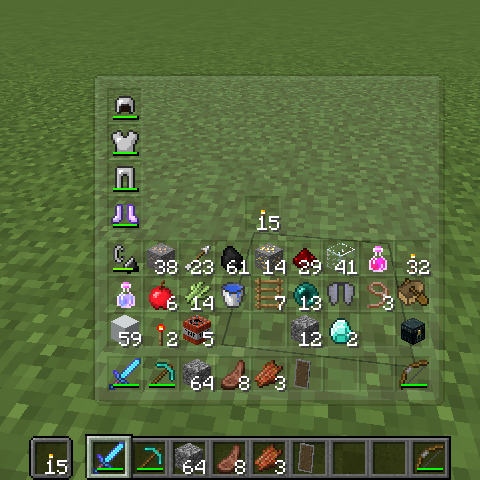 This extremely lightweight client-side mod adds in a super useful inventory overlay when you press the TAB key (reconfigurable)! This allows you to view your inventory contents on the fly without having to painstakingly open it up and check it! This mod was made because I was too used to games where pressing TAB would give you some sort of information, and felt like Minecraft was lacking it! If you like the mod, feel free to comment and suggest improvements! You can put the mod in a modpack without asking! I can usually be found hanging out in the Blood Magic Discord server if you ever want to contact me, or you can just do it via Twitter! I wish this was backported to 1.8, it would be really handy in lots of PvP situtations. Yea I can see how this would be quiet useful. Best mod for survival gameplay.